Germany's Continental, a leading global producer of tires, brakes and electronics, plans to move into the market for electric-vehicle batteries. At the Detroit auto show, Continental CEO Elmar Degenhart announced a joint venture with Korean battery maker SK Innovation to produce lithium-ion batteries for autos. 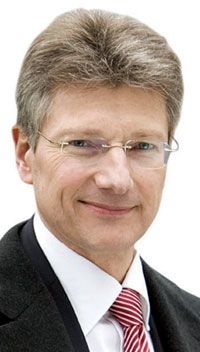 Degenhart, 52, predicted that the joint venture, in which Continental AG holds a 49 percent stake, will become one of the top three global EV battery producers. Degenhart also discussed Continental's entry into the turbocharger market, the auto industry's chronic tire shortages and his expansion plans for North America. Continental CEO Elmar Degenhart says the auto industry must bring EV production costs down to achieve volume sales. Q: Is your joint venture going to build a battery factory? A: SK Innovation is investing about $1 billion in a battery cell manufacturing facility in Korea. They will be flexible. They can also use this facility to produce battery cells for the consumer market. This is a big advantage. Our partner does not need to jump into the market with huge production volumes from the beginning. They can play on the consumer side and the automotive side. They have economies of scale. When will your joint venture start selling battery packs? Normally it takes two or three years to bring systems into production, so you can expect this joint venture to start generating sales in about two years. When will you generate significant battery sales? This is an investment for the future, definitely. Nobody is under time pressure. You can't expect to make big profits four or five years from now. By 2020, we are projecting that about 8 percent of 100 million vehicles produced will be hybrid, and another 3 or 4 percent will be electric. By 2025, the combined volume of hybrids and EVs could rise to 30 or 40 percent. EV sales in the United States have not been strong. Are EVs too expensive? We know from opinion surveys that customers are willing to pay $700 to $2,000 extra compared with a normal car. Currently, an EV costs about $13,000 extra. The industry must bring costs down, and this will not happen overnight. We have to introduce a second, third and fourth generation of EV technology to bring [the premium] below $5,000. We will need until 2023 or 2024 to do that. So we can't expect really high volumes until then. How much will Continental spend on battery research? That's not figured out yet. I can tell you that we have been spending about 170 million euros a year [on r&d for EVs and hybrids]. We won't have to make a huge investment on top of that, but we will have to add resources. Will the battery industry consolidate in five or 10 years? It's a difficult question. There are a lot of small players already in the marketplace. We believe the smaller players will disappear. Most of them will be acquired by the bigger companies, so there will be a natural consolidation. How many players will exist in seven or eight years? It's too early to say. Continental has entered the turbocharger market with a turbo for Ford Motor Co.'s new three-cylinder engine. What is the growth potential for turbochargers? We went into production last year, and we've had a smooth launch so far. We also acquired a second customer in Europe at the end of last year. The global volume of direct injection gasoline engines [often paired with turbochargers] was 4 million units in 2010. The latest projections are that it will develop to 15.8 million engines in 2016. We will see a significant growth rate for turbocharged gasoline engines in the next couple of years, and we want to participate in this growth. North American vehicle production is expected to grow 5 to 10 percent this year. Are you expanding North American capacity? We will probably need another electronics plant in two or three years. We are also building a new tire plant in South Carolina, and we are expanding our existing tire plants in Illinois and Mexico. We are gaining market share in tires. Are automakers in North America suffering from chronic tire shortages? Not only in North America but in all regions in the world. During the economic crisis, all the big manufacturers -- especially the Big Four tire makers -- reduced capacity. To shut down a facility takes six months. But to start an operation, especially a greenfield site, takes at least three or four years. The tire shortage will last for another 12 to 24 months, at least. Will your joint venture become one of the top EV battery producers? For sure. For batteries, our target is to be one of the top three players. For tires, we are not so much focused on being number three or two. Our aim is to grow faster than the market. Do you have a sales target for 2012? We will end up in 2011 with revenues of 30 billion euros. That's up from 20 billion euros in 2009, so we enjoyed a steep growth rate, for sure. In 2012, we expect [global sales] will grow 3 to 4 percent. If that happens, then Continental can expect a growth rate of 7 to 8 percent in global revenue. In November, Continental estimated raw material costs of 950 million euros for 2011. That was higher than expected, mostly because of synthetic rubber prices. Are you going to raise tire prices? In the replacement market, we haven't completely caught up. So we [will] introduce higher prices at the beginning of this year, especially for replacement tires. With most of our original-equipment customers, we have [negotiated] agreements in the last two years. Mostly we use a price index. We are getting at least part of the added cost reimbursed, [but] we have a time delay of three to five months. Continental ranks No.3 on the Automotive News Europe list of the top 100 global suppliers with worldwide original-equipment automotive parts sales of $24.8 billion in 2010.